Grey Ops: GreyOps.com and Goodbye? Hi all, in a possible last piece of news for Grey Ops, I just acquired my long sought-after GreyOps.com domain. I have a few ideas of what I'd like to use for the space, as I have a strong emotional attachment to the Grey Ops branding after all my happy years doing greyops.net stuff, but it with most certainty won't look like the old space. 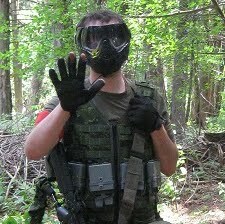 I never had a proper goodbye, but at this point and progression in my life, I think I can finally put the last nail in the coffin of the Grey Ops + Crypsis + Milsim + Woodsball + ©Blogging that was. It was great and awesome while it lasted, and I hope everyone I used to have a blast with is still slinging paint/pellets and hiding in backwoods hideouts across the Americas (when I put it that way, maybe I'm not missing out on much... just kidding, just kidding). Through running Grey Ops, interactions with some truly spectacular people, Crypsis, and the myriad other things I did at the time, I learned an incredible amount both personally and professionally, so thanks everyone. And if you're ever in Toronto/Hamilton (that's in Canada, eh), drop me a line and we can grab the intoxicant of your choice at a non-backwoods hideout.